I originally posted this in the Eurorack area but as it is a DIY thing I'll repeat it here. 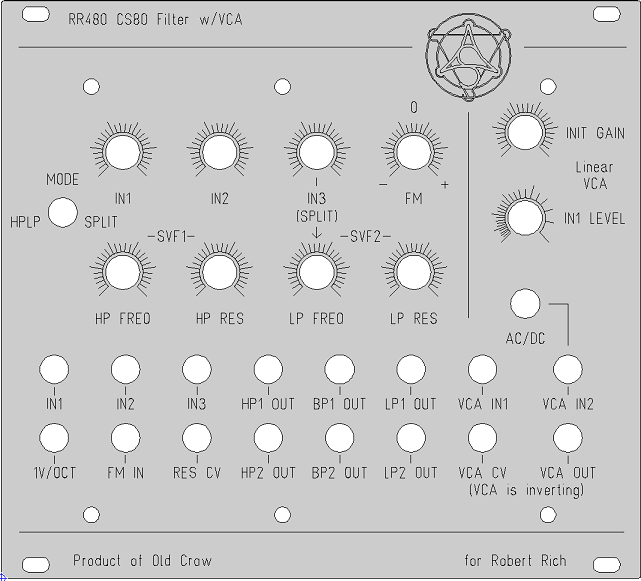 Another project I am squeezing in alongside the crowbx euro and crowminius is a eurorack bare board+panel DIY version of my CS80 filter, using the same core circuit I designed in 2001 for the MOTM-480, and more recently the M480 MkII. 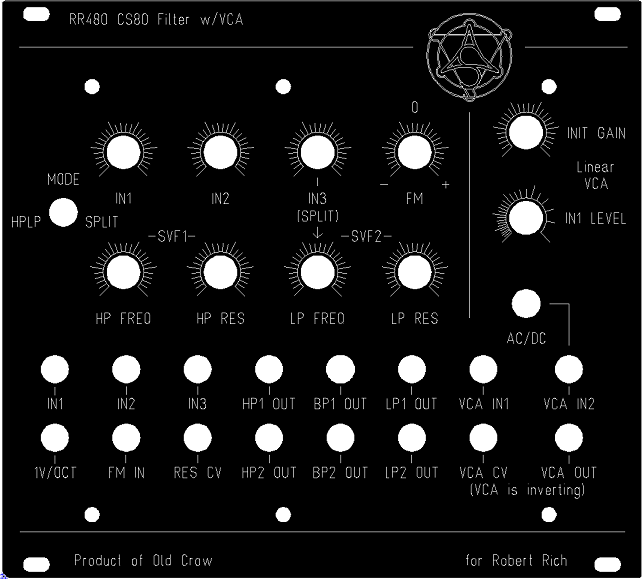 The euro version is a 28HP panel that includes two CS80 SVF filters and an "Irwin" VCA. A new feature has been added: an input mode select to allow the standard CS80 HP->LP filter chain or a split mode where two inputs go to SVF1, and one input goes to SVF2. All taps are available for both filters in either mode. The VCA is an inverting linear type that has two inputs, one with a level control and one with switchable AC/DC coupling. The rev2.3 board uses 10-volt sub-regulation to allow operation from +-12VDC to +-18VDC supplies. Update: mockup of a silver panel w/black in-fill added. I don't know if you want to but can't you order the engraved panels with no in-fill to cut cost? I always do that and then fill with acrylic. Works well. Anyway...really looking forward to this. When I do a black panel (or another color that is not silver) I do not use in-fill. A "natural" aluminum panel might need in-fill of some kind, however. I will order one and experiment. The production prototype is out in the field. When I get a report back (and nothing needs adjusted) I will order a batch of boards and open sales. Please put me down for a euro pcb/panel set. Whats the HP on this bad boy like? 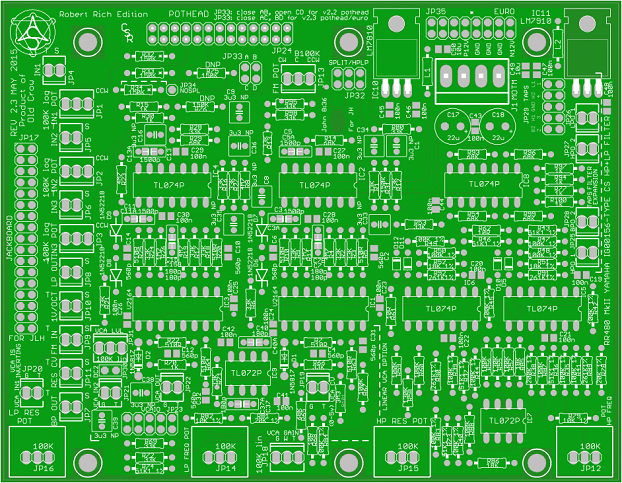 Really nicely labeled and layed out pcb by the way! looks great, im definitely interested. considering the size of the PCBs, when module is built with the (final) production version for euro, will it be parallel or perpendicular mount, and what will the module depth be? I have finally ordered a run of boards for this. This first batch is a small one, but subsequent batches will be bigger. I will offer panels (and the panel fpd file) as well. Oh great news. I'm really excited for this one!! Wooo! Gonna build the gx1 bandpass today and it looks beautiful. excited to see how this one comes out now! I JUST passed an order (Crowminius, CS80-Shruthi, NE11K, and PSTDNS) but I just saw that post!!! When are you expecting those boards? Am I just blind or not looking right or is it just you have been too busy? I also can't find this filter on your webstore! I'm interested, where do we order? 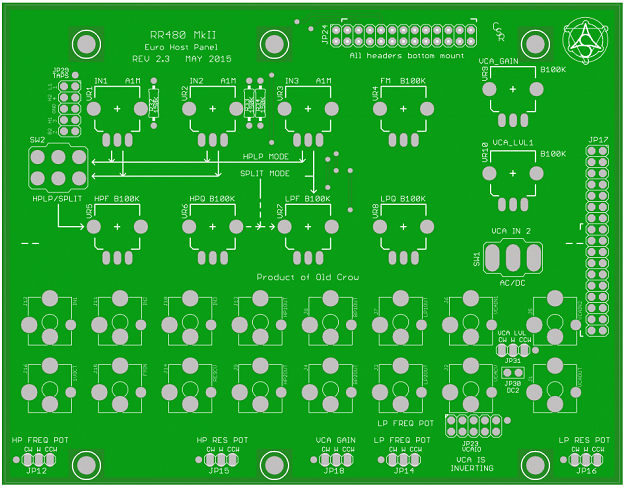 I've not added the filter boards to the store yet, I've been swamped with prep for Knobcon. I want the boards to actually be here too. They have been shipped, just now waiting for delivery. Will it be just the boards or panels as well? I'm guessing panels we can order ourselves direct from Schaeffer/FPD, is that right? Are there some audio demos for this filter somewhere?